Like many of you, I try to fly carry-on only whenever possible. 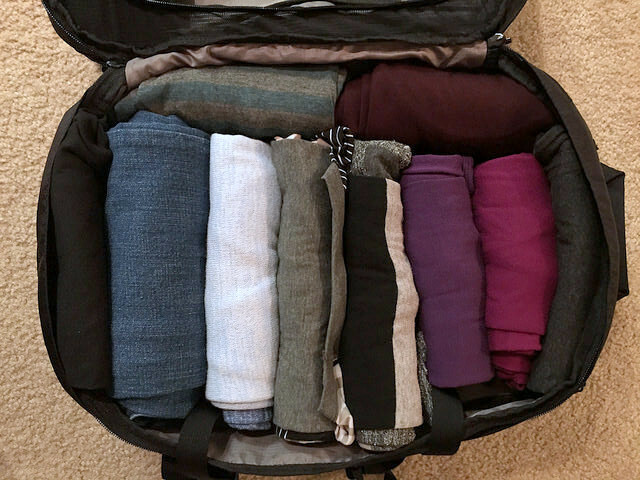 I haven’t checked a bag on a domestic flight in years, and when I travel internationally, I fit as many can’t-lose items as possible into my carry-on bag and personal item. Once my husband and I booked our recent 3-week trip to Australia (his first visit, my third), I knew I wanted to try a new carry-on bag. I wanted one that fell under the standard carry-on limit but still offered loads of space for clothing, travel documents, key electronics, and other travel essentials for women. When I was offered an opportunity to try the Tortuga Air Carry On Backpack, I welcomed the chance to test a backpack versus my go-to carry-on rolling suitcase. I wasn’t sure if I’d like a backpack as much as a case on wheels, but the Tortuga Air proved to be exactly what I needed for this trip. What is the Tortuga Air Carry On Backpack? The Torguga Air Carry On Backpack is designed for short trips, when you can comfortably fly carry on only. While the standard limit for carry-on bags tends to be 9 in x 14 x 22 (22 cm x 35 x 56), the Tortuga Air easily follows below that at 7 in x 12.5 x 19 (18 cm x 32 x 48). The Tortuga Air is the smaller sibling to the Tortuga Travel Backpack (which measures at the carry-on maximum size), and comes in at only 2.4 lbs (1.1 kg). When unzipped to its expanded size, the Air’s volume increases from 27L to an impressive 35L. With a suitcase-style opening, expansion zipper, sizeable front pocket, organizer panel for key items, electronics sleeve, side pocket, and a padded back and shoulder straps combo, the Tortuga Air offers the essential features for a practical, packable, and comfortable carry-on bag. >> Learn about all new Tortuga bag options on the official Tortuga Backpacks site. As soon as the Tortuga Air arrived, I opened the package to find a smaller, sleeker backpack than I expected. Although I had seen photos online and knew the bag’s dimensions, I’d also heard about how much this bag can comfortably fit when expanded. Once I inspected it in person, I wondered if it would fit everything I hoped it would. Just like my favorite rolling carry-on bag, the Tortuga Air unzips in the middle, offering two compartments for packing. The back compartment is deeper, but when the front section is unzipped and expanded to full size, I found both compartments to be equal. At first glance, my surprise favorite feature was the zippered hanging pocket at the top. When I first started traveling, my “personal item” was a smaller backpack, and I always stashed several go-to items in its hanging pocket. I also loved the amount of padding in the back panel and shoulder straps. While the Tortuga Air was designed for short weekend or business trips, I hoped the Air would be my primary bag during the 3-week trip to Australia. And after once having an airline lose my bag, I secretly hoped all of my clothes would fit into the Air. When I realized I had fit ALL of my clothes into the bag, I breathed a sigh of relief (and patted myself on the back)! I didn’t even have to expand the bag to full size. We’d already paid to check a bag, as we knew we’d pick up some items in Australia, so I tossed my second pair of shoes, toiletry bag, and feminine products in that one. I stashed a few other odds and ends, along with travel documents, in the front pocket and hanging pocket. As someone who usually uses a rolling bag, I was a little nervous about carrying a backpack, wondering if it might feel heavy within minutes of walking around the airport. I’ve had lower back problems off and on for over 10 years, so I’m super protective of my back. Although I had packed just about every square inch of the Tortuga Air, I was extremely surprised by how light it felt. The Air almost felt just like that – air. I’ve carried smaller bags with fewer items in the past, and the Air felt lighter than any of those ever did. Even after walking around the airport and traveling for hours, I was all smiles. About mid-way through the trip, we enjoyed a 2-day road trip, and my husband and I used the Air as the only bag for the two of us. This time, I used the expansion zipper so we could pack clothes, toiletries, and travel odds and ends, and I also tried the chest strap. From the outside, the bag doesn’t appear to be too much larger when expanded, but the expansion certainly offers enough room for a few more items. Throughout the three weeks, the only time I struggled with the Tortuga Air was on the long flight home. As soon as we landed at LAX, I was tired, the weather was humid, and we had to speed walk around the airport through various checkpoints. The bag started to feel heavy, and I felt extra warm with my back being covered and the straps under my arms. However, this would happen with any backpack, and my lack of sleep and the weather didn’t help. Not bad when this is your only complaint! That I’d realized there was a water bottle pocket sooner. I didn’t use the side pocket until halfway through the trip, and even then, it didn’t click that it would fit a water bottle perfectly. To experiment with a second pair of shoes and toiletries on my next trip. I’m flying from Virginia to California for a long weekend in October, and I plan to pack a little differently for that trip than I did for this. My first trip with the Tortuga Air was an overwhelming success! I’ll definitely use it for both domestic and international flights for years to come, and I wouldn’t hesitate to recommend it. >> Interested in learning more? Head over to the official Tortuga Backpacks site now. We are affiliated with Tortuga Backpacks, and if you make a purchase, we will get a small commission at no extra cost to you. >>See all female backpack reviews here. Nice review for sure. I took my tortuga as my carry on and as a place to pack gifts when I went to Morocco earlier this year. It holds a whole wardrobe and neatly, too. I am going to New York to buy fabric and rather than take a rolling bag, I’m going to try packing everything in my Tortuga. The only problem I had was that there are a lot of zippers. One day I will tag them so I know where things are. Great information Heather. Thanks so much! dang I’m going to southern Italy for 3 weeks and I’m planning to take a fraction of this list. Now I’m nervous. I’ve a question: how tall are you? I’m thinking of getting the Tortuga Air myself but I’m a petite 5’0″ and am afraid that it might be too big/overpowering for me. What are your thoughts? Hi Emma, I’m 5’6″. I have fairly wide shoulders and hips, and I’m not sure of your build, but I can see that the bag might be a big long for you. I’d recommend reviewing the link that Brooke shared! I use the Tortuga backpack. I’m 5’3 1/4 (yes, I count any bit of it) and average to slim build. That full size back is perfect for 3 weeks in Europe. I find that the Tortuga Air is too small for long trips but it would totally be one that I would take for a 1 week or shorter trip. How much did it weigh when packed? New Zealand airlines (and some others) only allow 7 kgs carry on – were you able to keep within that limit with that amount of stuff? Do you think this backpack could pass as my personal item if I don’t plan to put too much in it? Like substitute as a purse, and put my camera and laptop and maybe a sweater, scarf. I am a bit late to the party, but I have traveled to Europe and Asia for 2-3 week trips and I have been perfectly happy with my Air. I pack a bit differently, as I keep a clothes-drying line and do laundry in the sink along the way. However, I can easily fit a few changes of clothes, two pairs of shoes, a backup luggage bag (never used it, but at least it is there), and souvenirs. I also have the rain cover–which is on whether it is raining or not because it saves space and acts as a theft-deterrent (it covers all the zippers, so a thief wouldn’t know where to start if I am rushing through the metro).